When Annabel put out to the Twittersphere that she was looking for bloggers to guest post for her, I jumped at the chance. Annabel’s blog is one of my favourites so it’s an honour to be writing this post on her blog! I thought I’d share some of my favourite indie brands that I’ve discovered since going green. Our Tiny Bees are a brand that are focused on, of course, bees and honey. They are beekeepers and use British honey in their products. My favourite is their Purifying Detox Mask which is full of rhassoul clay, dried honey, oats and mango that draw impurities out leaving clearer, brighter skin. Their Bath Melt is also pretty darn relaxing. It looks like a chocolate bar but don’t be fooled, this bar of cocoa butter, shea butter and honey is deeply nourishing and soothing. One of my favourite cleansers comes from the brand Lyonsleaf who are a husband & wife duo that grow some of their own herbs for their products. Their Beauty Balm is my favourite as it features ingredients like clary sage, babassu oil and Palmarosa to cleanse my skin, revealing a lovely glow after. Last but certainly not least is a brand that is local to me; The Earth Works Cosmetics. Their new limited edition Cedarwood & Bergamot Bath Oil is just heavenly. It’s from their Christmas gift set (sorry if you’re not in the Christmas spirit yet!) and smells so Autumnal and relaxing. Pop a dabble of this into your bath for a truly relaxing, pamper evening! I have got to try these indie finds out! 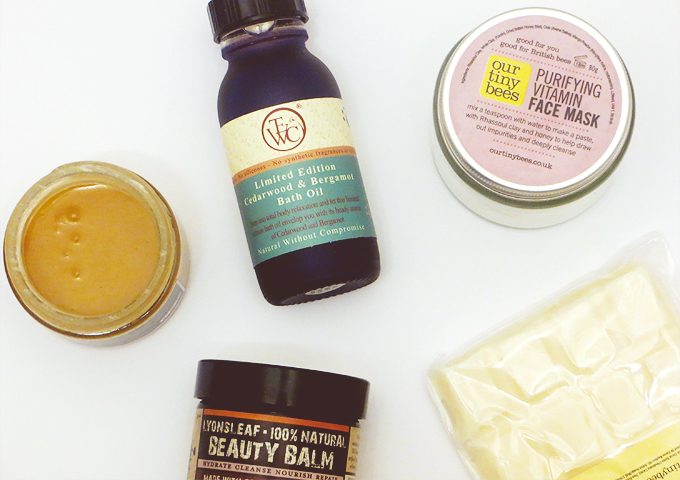 Especially the Our Tiny Bees Purifying Detox Mask and Lyonsleaf.